D. August 1620 at Parish of Kettle, Fife (left a Will) Ref. John Pitcairn cared much for his second son, Robert. In the old charter granting him lands, on the 24th November 1581 he expresses the love he had for him. 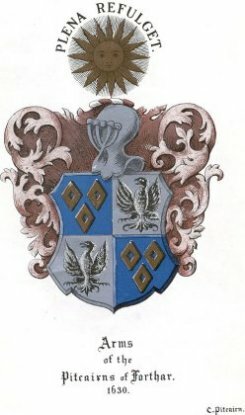 Mr John Pitcairn of Forthar, for the love he had to his lawful son, Robert Pitcairn, and that he might live honourably, gave sasine to the said Robert of the lands of Dounfield in Fife, with the tower fortalice and manor, mill an lands thereof to himself (Mr John Pitcairn) and Agnes Aytoun his wife. Witnesses were Patrick Pitcairn and others. On the death of his father in 1593 Robert Pitcairn came into his inheritance, and on the 28th July 1598 his mother died. Her will was confirmed at Kettle, and she is called Agnes Ayttoun, Lady Elder of Forfar. Henry probably bought back the lands of Dounfield from his brother Robert, in exchange for the lands of Easter Gelet, which he sold to him the year before. Robert Pitcairn then went to live at Easter Gelet near Dunfermline (which now belongs to the Earl of Elgin and Kincardine. Robert married and had two sons, Henry and Thomas, who were witnesses to a deed Dec. 6th 1625 where they are called sons of the late Robert Pitcairn of Dounfield.